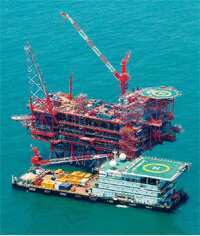 Exploration mode: A control and raiser platform at the KG basin. RIL has estimated a reserve of 50 tcf of natural gas in the basin’s D6 block. Mumbai: Reliance Industries Ltd, or RIL, wants to sell a stake in six overseas hydrocarbon blocks owned by its fully-owned subsidiary Reliance Exploration and Production DMCC, or REP.
RIL has an interest in 14 overseas blocks in addition to 35 oil and gas exploration blocks and five coal bed methane blocks in India. The Indian company will continue to own the licence to operate these overseas blocks even after the proposed sale. This process of bringing in outside investors is termed a farm-out and involves the investors getting a direct interest in a hydrocarbon block in return for funding historical and future spending in proportion to the stake sold. “This is an ongoing exercise and not something new or a one-time exercise," said an RIL spokesman, adding that the move to bring in other investors will help “spread the same budget over a larger number of projects (and) also benefit from the experience of others". RIL initially kicked off the farm-out process for these six blocks in Yemen, Oman, Colombia and Australia in 2008, asking prospective investors to submit signed confidentiality agreements by 15 December and hoping to close the deals by at least 31 March 2009 in all but the Oman block, where the planned effective deal closure date was 20 September 2008. The company was not able to close the farm-out deals by then, and has still kept the transaction open. A company official said there is no fixed deadline for this transaction. The numbers should excite a prospective partner. Companies that own the rights to operate hydrocarbon fields often go back to prospective investors with new sets of numbers. “It is about risk management at the end of the day," says Partha Ghosh, who teaches leadership at the Massachusetts Institute of Technology and is an adviser to many multinational energy companies. Ghosh says a company bidding for a hydrocarbon block faces three risks—investment, political and technological. National oil companies from China, Malaysia and Mexico prefer to share their risk with a local partner as part of political risk management. Multinational companies such as Exxon Mobil prefer to go solo. RIL, a relatively new entrant in exploration and production, does not have the luxury to compromise on technology or investment and also needs to build international credibility. Moreover, the Indian company is balancing its portfolio in such a way that the risks in upstream, mid-stream (logistics) and downstream activities are equally distributed, added Ghosh, a former partner at consulting firm McKinsey and Co. According to the offer documents offered to prospective investors that were reviewed by Mint, RIL plans to sell a 35% stake in two onshore oil blocks in Yemen, an unspecified stake in an offshore block in Oman, a 60% stake in two offshore blocks in Pacific Ocean in Colombia and a 60% stake in an offshore gas block in the Bonaparte Basin in Western Australia. The offer documents say that technical evaluation of two offshore oil blocks in Colombia has confirmed “hydrocarbon prosperity" while REP expects nearly 10 trillion cubic feet (tcf) of natural gas in the offshore Australian block. RIL has estimated a reserve of 50 tcf of natural gas in the D6 block in the Krishna-Godavari basin off India’s eastern shore, and 9.5 tcf and 10.8 tcf in the D3 and D9 blocks respectively. It is not clear from the offer documents how much money RIL plans to raise from these deals. Governments usually award rights to private sector contractors for oil and gas basins depending on their technical capability and the amount of royalties and profit they offer to share with the government over the period they have a licence to operate a hydrocarbon block.